Today I made a quick run to the grocery store. I had a pretty full mini-cart, but there were 3 open spots at the self-checkout. So despite the signs warning me that there was a 20-item limit, I took the plunge. As I scanned item after item, I was increasingly worried that I was going to exceed the maximum. I was pretty sure that as soon as I picked up my 21st item, a security guard would shut down the entire transaction, handcuff me to my mini-cart, and lead me over to full-service checkout lane. But then a magical thing happened. 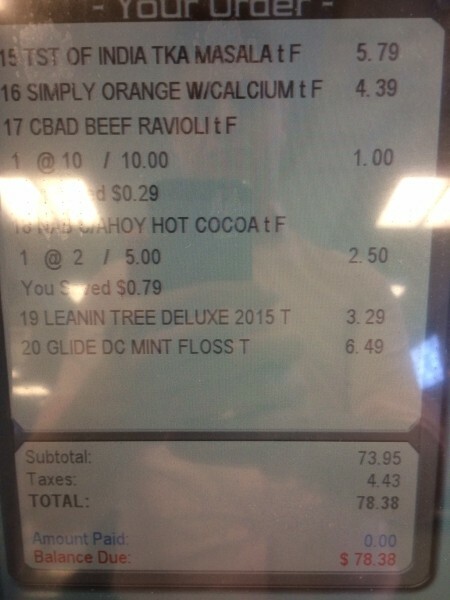 My 20th item–a two-pack of Glide floss–was the last item in my cart. This was incredibly satisfying. So satisfying, in fact, that I took a photo. Have you ever had the satisfaction of getting exactly the right number of items without even realizing it? Better yet, have you ever gone over by a few items? What happened? How many times were you tasered? This entry was posted on Sunday, November 8th, 2015 at 10:00 pm	and is filed under pet please and tagged with pet please. You can follow any responses to this entry through the RSS 2.0 feed. I’ve had the look of death for going over the limit. But unless it’s over by more than five items I will stick to the regular line. I feel the same way about the speed limit, 5mph over is okay. Whoops. I meant if it’s over the express limit by more than five items I will head to the regular line. I think I worded my initial post incorrectly. I’m pretty sure that if you try to go over 20 items, it becomes like that scene in Sophie’s Choice, but with food. They try to pry your Java Chip ice cream from your hands, and you’re screaming, “No, take my Billy Goat chips instead!” You can only save one of them, but the choice will haunt you forever. Count carefully before you check out, Jamey. Is that a risk you really want to take?